Pedology or soil science was established as a new academic discipline more than a hundred years ago by the prominent Russian scientist Vasily Dokuchaev (1846-1903), who has been recognized worldwide as its founder. Dokuchaev defined soil as an independent natural body developed over time under the influence of five soil-forming factors: parent rock, living organisms, climate, relief, and time (Dokuchaev, 1948). This has become a classic definition of soil. He suggested a classification of soils based on scientific principles and was the first to examine their geographical distribution. The development of the theory and practice of soil conservation is also credited to this outstanding scientist. Many other scientists, who worked in the former Soviet Union (FSU), also contributed greatly to the development of genetic pedology: Vysotsky (1901), Neustruev (1913), Glinka (1927), Volobuev (1963), Dobrovolsky (1967), to name but a few. (4) genetic aspect: primary use of properties and indications connected with the origin and history of soils related to the general geological history and paleogeography of a given area. This approach uses a degree of expression and differentiation of soil profile, accumulation or loss of separate compounds, and transformation of the soil-forming material. The application of this methodology reveals the main features of the soil geography of Northern Eurasia, such as bioclimatic zonality, lithologic differentiation of soil cover, landform and geochemical connections, and age differentiation of soil cover and their relationships with soil-forming factors. While this methodology is widely used in the FSU, in other countries different non-genetic criteria are employed (Klassifikatsiya, 1977). As a result, systems used to classify soils differ. 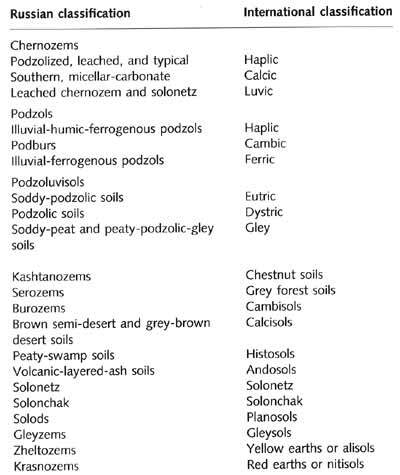 The lack of a uniformly accepted classification scheme complicates work and international effort is currently aimed at the creation of a standard classification of soils (РАО-UNESCO, 1990; World Reference, 1994; Stolbovoy and Sheremet, 1996). To assist the reader, I have attempted to match the classification used in Russian-language texts with that used elsewhere (Table 4.1). 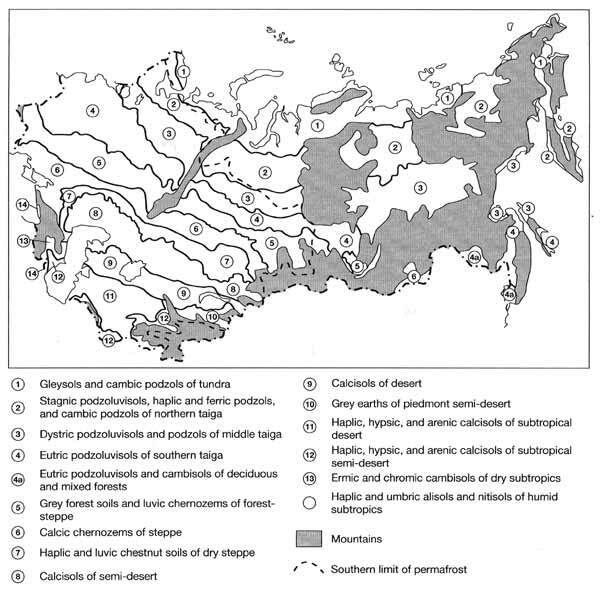 The main soil regions and the corresponding vegetation zones of Northern Eurasia are shown in Figure 4.1. The soil grouping of Northern Eurasia reflects much of the soil diagnostics, nomenclature and definitions elaborated in the framework of international cooperation during the compilation of the РАО-UNESCO world Soil Map (FAO-UNESCO, 1990).